Congressman Alex Mooney (R-WV/2nd) with TCA summer interns in Washington, DC. 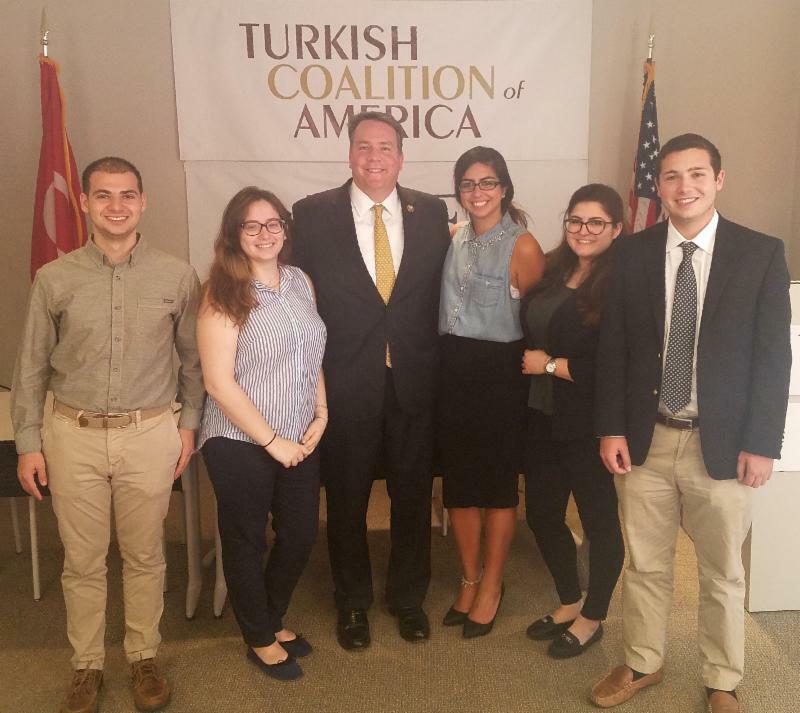 On June 9th, members of the Turkish American community met with Congressional Turkey Caucus member Rep. Alex Mooney (R-WV/2nd) at TCA’s offices where they spoke with him about U.S.-Turkey relations and Turkish Americans. Rep. Mooney also spoke with the TCA summer interns about their education and career goals and the importance of getting politically involved. On June 1, TCA hosted a forum with the Turkish American community in New York to discuss raising the voice of Turkish Americans in civic and political activism and the Turkish American Women's Leadership Initiative. TCA President G. Lincoln McCurdy gave a presentation on the importance of getting politically involved followed by a group discussion with attendees. TCA's Washington Summer Internship Program is off to a great start! This summer TCA welcomes 18 interns to Washington, DC to participate in the program. Interns are working on Capitol Hill with the offices of Reps. Alcee Hastings (D-FL/20th), Darren Soto (D-FL/9th), and Gregory Meeks (D-NY/5th), the Democratic Party of Virginia, and the TCA office. The Washington Summer Internship Program is open to undergraduate/graduate students and recent graduates of Turkish American heritage. Now in its tenth year, the TCA Washington Summer Internship Program has provided 162 internship opportunities for young Turkish Americans at Congressional offices throughout Washington, DC. Designed to enhance Turkish American participation in political life, the program provides an opportunity for young Turkish Americans to live and work in the nation’s capital, learn about the American political process, contribute to U.S.-Turkey relations and the TCA mission, and explore career opportunities in public affairs. On June 29, TCA President G. Lincoln McCurdy attended a Congressional Black Caucus (CBC) reception in Washington, DC where he spoke with Congressional Turkey Caucus members Reps. Greg Meeks (D-NY/5th), Danny Davis (D-IL/7th), Brenda Lawrence (D-MI/14th), Alma Adams (D-NC/12th), Val Demings (D-FL/10th), Dwight Evans (D-PA/2nd), and Bonnie Watson Coleman (D-NJ/12th). Five students received the TCA Study Abroad Scholarship for Students of Minority and Heritage Communities in June, bringing the total number of scholarship recipients to 487 since the program began 2008. The program benefits American students of African, Armenian, Bosnian, Filipino, Hispanic, Macedonian, and Native American heritage. Scholarships are awarded to eligible undergraduate and graduate students who have been accepted to a university study abroad or language program in Turkey, the Turkish Republic of Northern Cyprus (TRNC), or Bosnia and Herzegovina (BiH). The students who received scholarships in June attend Western Kentucky University, Seattle University, the University of Texas at Austin, Grand Valley State University, Loyola University Maryland, and the University of California Berkeley, and will be studying at Koc University in Istanbul, Turkey, Tomer Institute in Ankara, Turkey, and the American University of Bosnia and Herzegovina in Sarajevo (BiH).